Reacting to a fresh fiery speech of ex-party member Nehal Hashmi criticising state institutions, senior Pakistan Muslim League-Nawaz (PML-N) leader Rana Sanaullah on Friday said that Hashmi’s statement has nothing to do with his party and only reflects his personal views. Hashmi, a sacked member of the PML-N, surprised several quarters after he vehemently criticised state institutions, including the Pakistan Army, at a gathering earlier on Friday. Reacting to Hashmi’s statement, Sanaullah categorically stated the Hashmi was expelled from PML-N so party cannot take action against him. He reminded media that Hashmi was sacked after he had refused to leave his senator’s office on the party orders after a similar statement targeting judiciary. Sanaullah said one could disagree with institutions but that was not the way to register a protest. Hashmi was earlier jailed and fined for using foul language against judiciary and threatening the judges of superior judiciary. 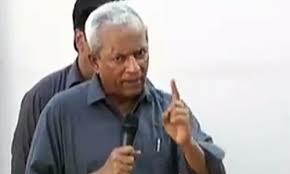 The Supreme Court on Feb 1, 2018 had announced its reserved verdict in a contempt case against Nehal Hashmi, awarding him one-month jail term and a fine of Rs 50,000.